The Letter of James is all about putting Christian faith into action. In fact, it says that faith without action is dead. It defines “pure religion” as something we do—visiting “orphans and widows in their affliction”—and urges us to be “doers of the word, and not hearers only.” John Wesley, who emphasized the importance of practical religion, had a special affinity for this letter. 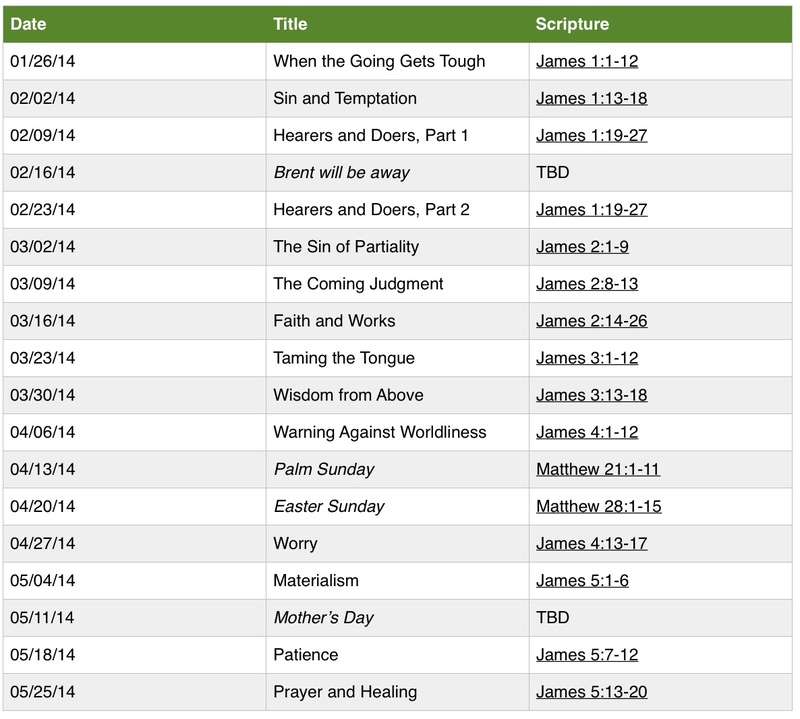 Next to Proverbs, James is perhaps the most practical book in the Bible. It teaches believers how to cope with the biggest challenges we face as Christians. These include: handling stress, resisting temptation, taming the tongue, overcoming greed and materialism, being patient and not worrying, and praying with boldness. Click to expand this schedule. This entry was posted on	January 2, 2014 at 3:22 pm	and is filed under Uncategorized. I love James & preached it in 2012. It was fun. I loved Scot McKnight’s commentary on James and used it every week. Also the one done by Doug Moo in the Pillar NT series that Eerdmans publishes was good, too. And some others, of course. Clay, I’m embarrassed to say, especially as a Wesleyan, how little I’ve preached from James! Glad to hear about these resources. I’ll order them. Is Bruner’s Matthew commentary a part of that Eerdmans series? BTW, I’m following this series with the Second Coming. Any book recommendations there? I went ahead and ordered the old (out of print) Eerdmans “I Believe in…” book on the subject. But what else? That I Believe book is great. Stephen Travis is quite good. A new one I just finished is, “Essential Eschatology,” by Jay Phelan. Another I read in school is, “The Bible & the Future” by Anthony Hoekema. I still refer to it now and then. Phelan’s book is a primer on the subject. And of course Bishop Tom’s, “Surprised By Hope.” Travis is a good scholar from Britain. I really liked Phelan’s book a lot. Love the book of James and can’t wait to hear what God has placed on your heart to share with us. Praying for you and your family as this new year begins 2014!